Hatsune Miku is a singing synthesizer application and its female character, developed by Crypton Future Media. It uses Yamaha Corporation's Vocaloid 2 synthesizing technology. 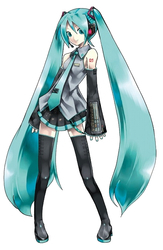 The name of the character comes from a fusion of the Japanese for first, sound and future, referring to her position as the first of Crypton's "Character Vocal Series". Her voice is sampled from Japanese voice actress, Saki Fujita. Hatsune Miku has performed onstage as a projection.